A herd (mob? flock?) 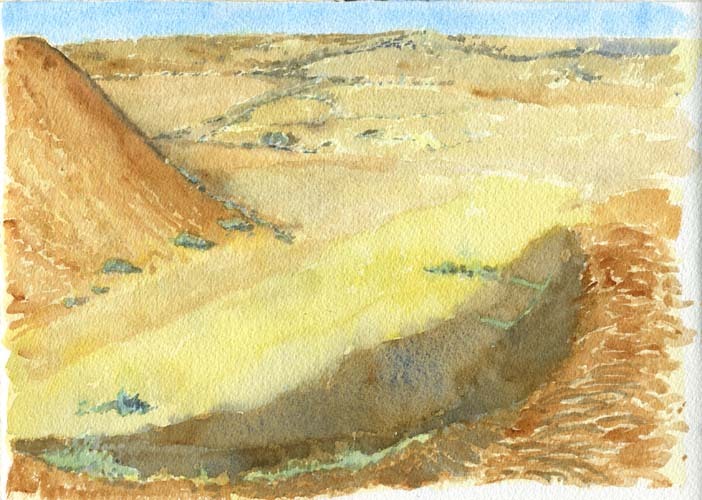 of camels in the dunes south of Ras-al-Khaimah; both camels and sand were shades of yellow ochre and sienna, warmer and more orange than the paper colour. The only other colour in the scene was the azure of the sky. They were lean, wild, graceful animals compared with the chunky, phlegmatic camels of rural India that pulled heavy carts along the roads to market. We travelled to the Emirates, after our trip to India, to see our daughter Sarah Jane, who was living there while teaching English at an American university. Ras-al-Khaimah, sometimes known merely as RAK, is one of the United Arab Emirates; its hinterland away from the namesake city occupies the northwest edge of the "horn" of Arabia which points across the Strait of Hormuz toward Iran, its coastline bordering the Persian Gulf. The tip of the horn is Musandam, a province of the Sultanate of Oman disconnected from the main part of Oman by Fujairah, another one of the Emirates. Yes, it's confusing geography. The Emirates themselves were founded nearly 40 years ago out of the old "Trucial States" that the British had overseen for 150 years -- only paying enough attention to them to ensure the Russians and French didn't gain any influence and thus potentially disrupt trade routes to India. Immense oil reserves at Abu Dhabi and Dubai have since made the Emirates awash with cash – Dubai's wild architecture and luxurious resort developments have become a worldwide symbol of excess [postscript in late November, 2009: Dubai's development company's inability to make payments on debt prompts a mini-panic on world stock exchanges. 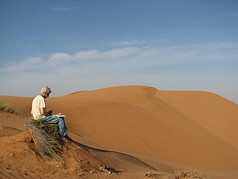 Abu Dhabi, the richest of the Emirates, stepped in to help]. Ras-al-Khaimah, by comparison, is a minor player with less speculative development; it has some oil and industrial development, notably massive cement plants that throw a haze across part of the coastline, and the city is rapidly building highrises and malls, all plopped higgledy-piggledy around the old town. It is making a real effort to be the "education Emirate," attracting overseas universities and training facilities. We had the feeling that we were seeing it at a transition point: we could walk a few minutes in one direction from Sarah Jane's apartment to a Hilton resort on the beach, in another to a traditional fishing community on the lagoon. Five years from now, perhaps, it will all be groomed and luxurious and, to our romantics' eyes, characterless. The best of our photos from the trip are on Christine's blog. Sarah Jane's photos of our visit and her adventures there are on her Flickr site. This was not a place where it was culturally acceptable to take photos of people; people really noticed if you were looking at them (or drawing them). 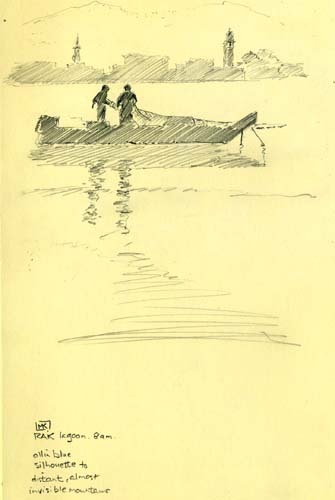 I had a discreet spot on a plastic chair when I was doing the pencil sketch of the fishermen below, although I think they wondered who I was when I started -- what was I doing? Was I a government official or ... ? No foreigner has civil rights in the Emirates, and it's said to be very easy to find yourself accompanied to the airport and put onto a plane. Painting notes for this trip. 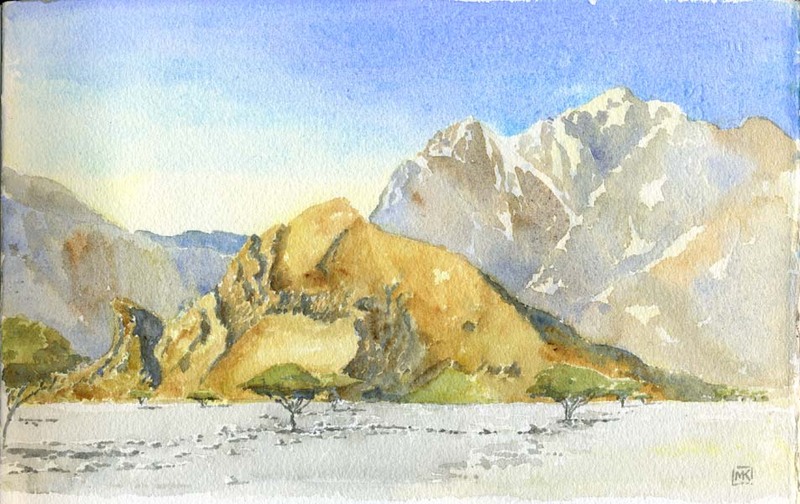 The backbone of the horn is some of the most arid mountain landscape you could find anywhere. 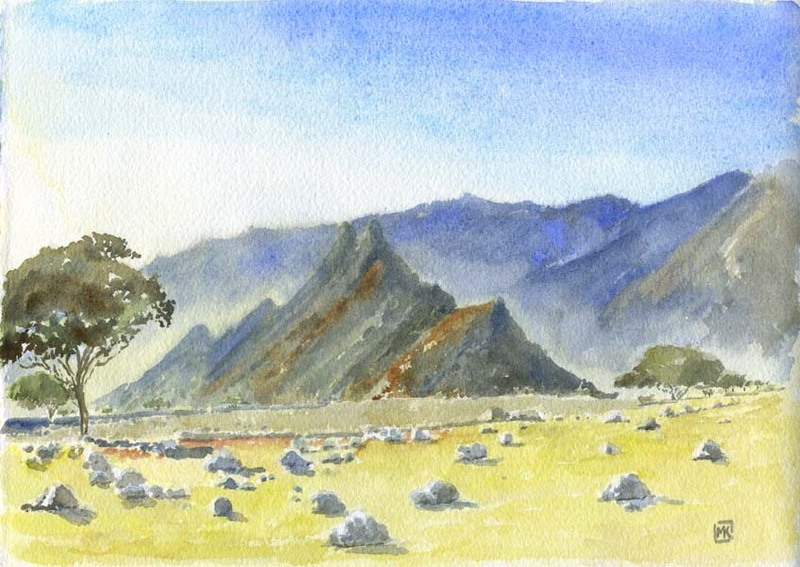 Wadis (valleys) strewn with rocks and dotted with thorn trees and goats wind inland like gnarled fingers from the narrow coastal strip. It was March when we were there, temperature about 30 degrees, with the same cloudless sky day after day. 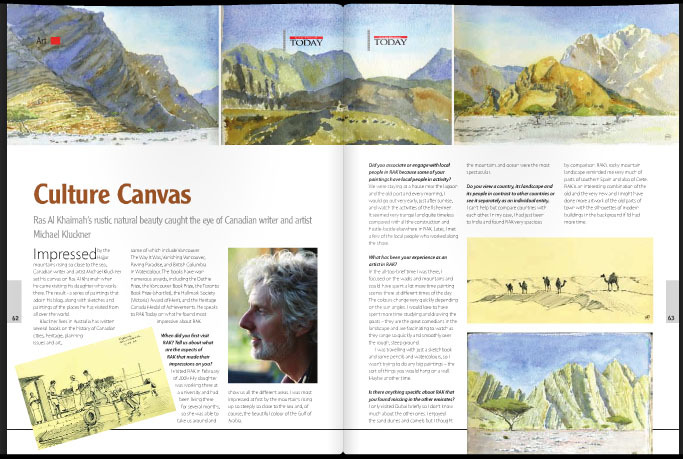 Colours are bleached out of the landscape by the high midday sun, but return to the rocks in a glowing palette as the sun sinks into the west in the late afternoon and shadows creep from every crevice to mould the rugged shapes. 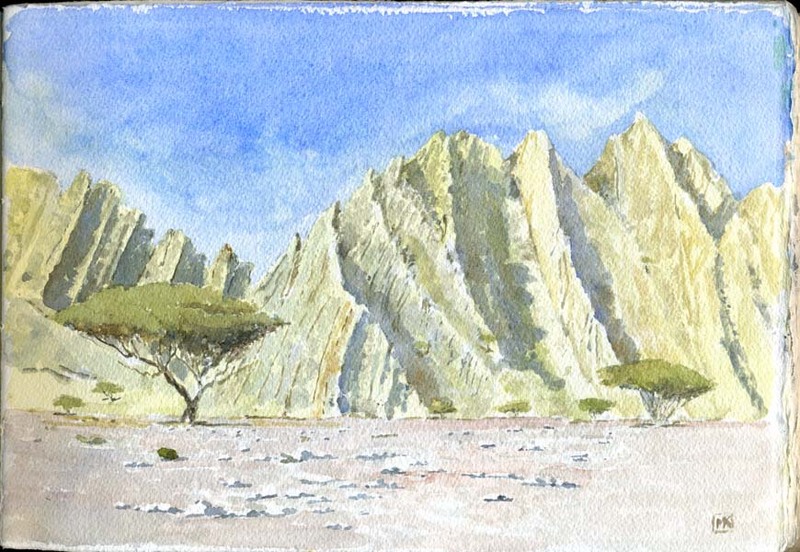 (Above) Three views of Wadi Bih, daubed frantically late one afternoon as the heat went out of the air and the chill of the desert night began to rise from the shadows. 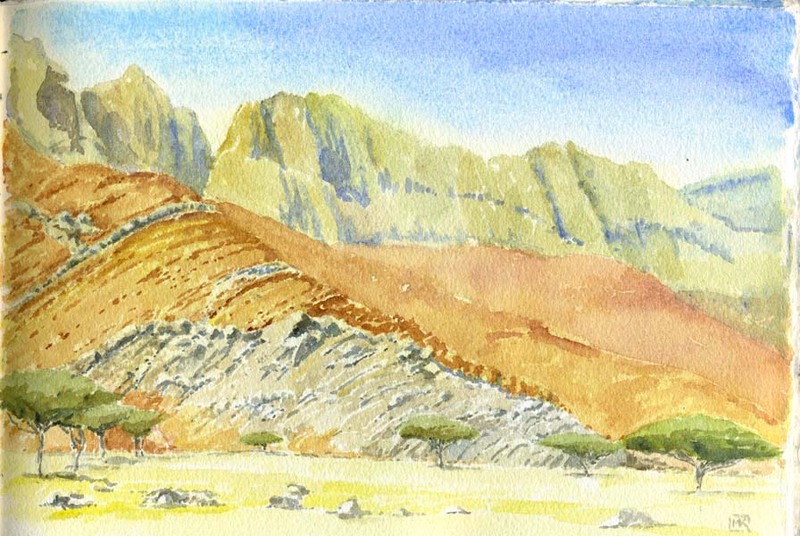 (Above and below) Wadi Ghalilah, further north near the Oman frontier. The mountainsides are coloured stony ribbons tossed up and contorted by some grand power, perhaps tectonic plates pushed together or ancient volcanoes. 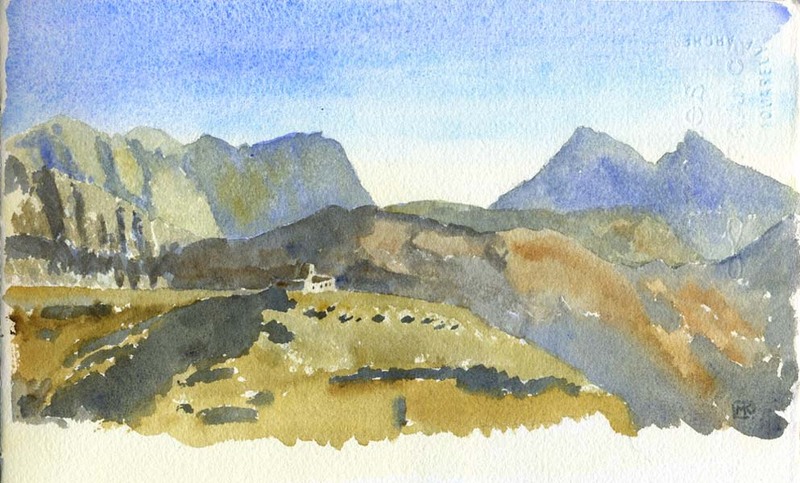 The occasional old dwelling in this all-but-deserted place is built of the local stone and is, thus, almost invisible, blending seamlessly into the terraced hillside like the one on the sunlit slope in the image above. Somehow goats and their herders eked out an existence here for millennia; further south and west, in the more open desert, the only inhabitants were nomadic Bedouin until a generation ago. 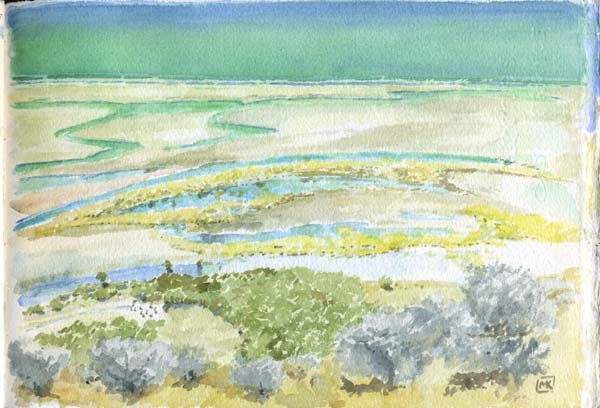 Sarah Jane took a picture of me perched on a clump of desert grass that looked like a nest and trying to paint the soft, moulded dunes, 15 or 20 metres high. Talk about a scene with no focal point, no composition, no nothing! It looks very tranquil, but in fact we were assailed by ATVs and SUVs tearing around, climbing every available dune and rocketing off noisily in every direction. The Emirati, whose behaviour bears a startling resemblance to rich teenage boys', just love to turn their cheap fuel into fun, as it were. 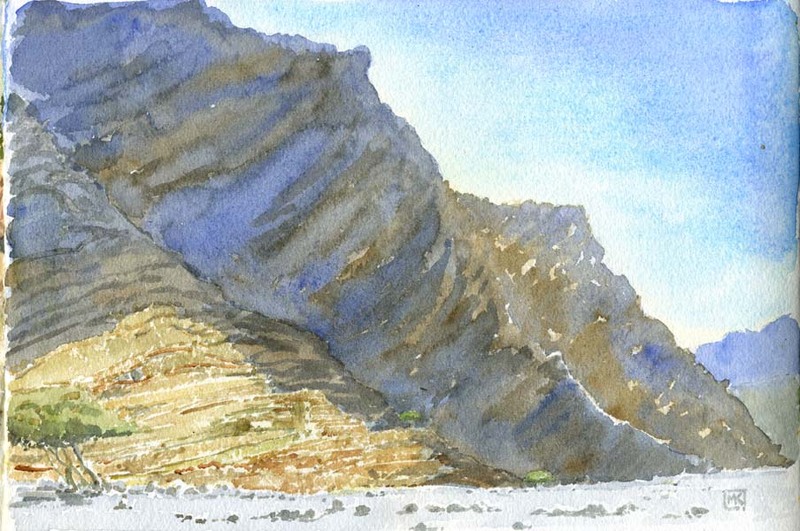 It was a similar situation when we were on the coast: untouched beaches, like the one I painted further down this page, were dotted with jeeps and ATVs and turned into impromptu race tracks at low tide. One scene I will not soon forget was a huge Hummer doing doughnuts in the soft sand on the edge of the turquoise sea. "What to do? What to do? Let's go rampage around in our trucks....!" Camel-racing season was over, so we didn't have the pleasure of a quieter form of recreation. I was out walking at dawn every morning to watch the sun come over the hazy mountains and the fishermen in the lagoon. A fishing village occupies the inner shoreline of the lagoon on the edge of the city; small concrete wharves with little concrete flat-roofed huts behind them line the lagoon's edge. Nets are sorted and the day's catch landed in time for the afternoon auction. The outer shoreline, hundreds and hundreds of acres, is being filled with sand and soil and compacted for new resorts and luxury accommodation, I presume. 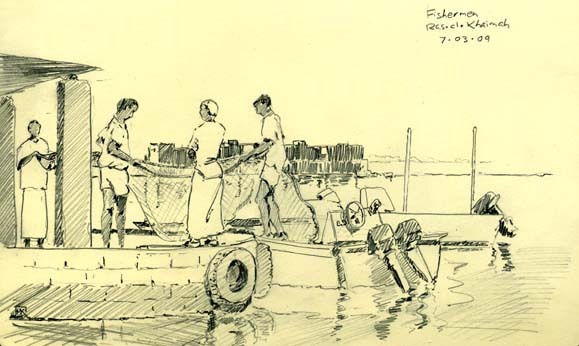 The fishermen were perhaps Yemeni or Somali, working with their long "skirts" rucked up into their waistbands. Their long sleek boats with big outboard motors seemed similar to the ones used by the infamous Somali pirates in all the TV footage I've seen. (Below) On the other side of the lagoon from the fishing village, an abandoned dhow lay on the sand just below the high-tide mark. 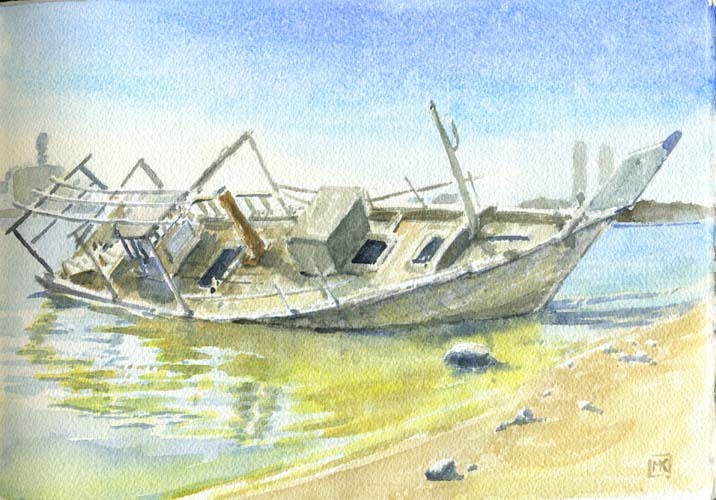 There were a few dhows still with their sails in the waters off Oman. This one obviously could once have sailed, as it has the mast near the bow into whose slot the boom of its lateen sail fitted, but it also once had an engine, as a rusted smokestack still protruded through the deck amidships. (Above) South of Ras-al-Khaimah, a pristine beach where a serpentine creek crosses the tidal flats and flamingoes rested in the lagoon. 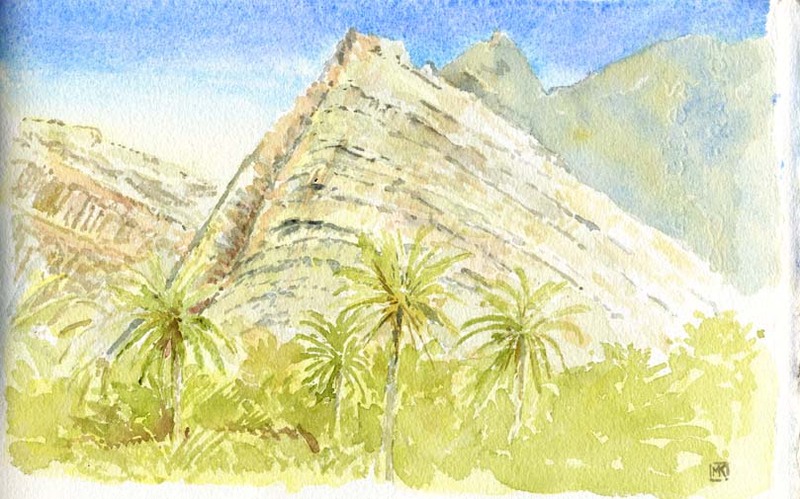 (Above) Date palms near the coast in Oman, with the characteristic twisted ribbon mountainside behind. (Below) An old fort near the frontier between Oman and Ras-al-Khaimah, one of several along the coastline. There was a story we read about a rebel group that was unwilling to sign a truce with the neighbouring tribal leaders and held out against the British for a time because the latter lacked any artillery powerful enough to dislodge them. When the British -- in command of the famous Trucial Oman Scouts -- arrived with their largest cannon, the rebels surrendered after only two shots were fired at them. 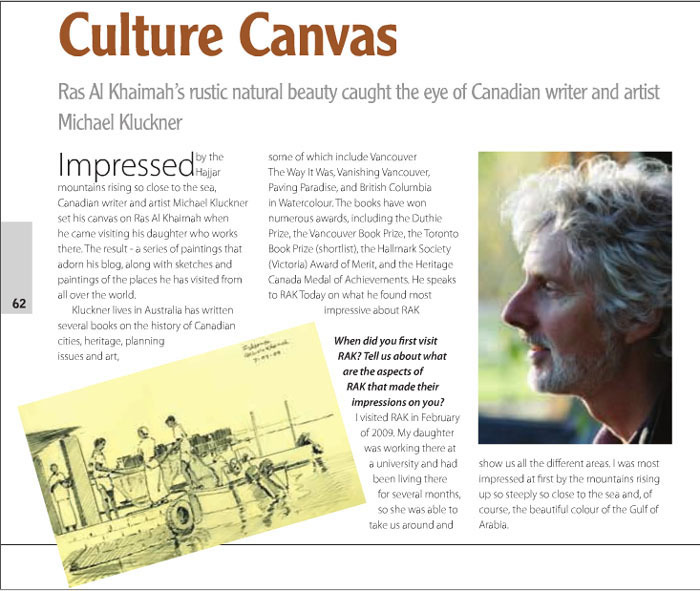 RAK Today magazine published an article in its January, 2010, issue on this trip. 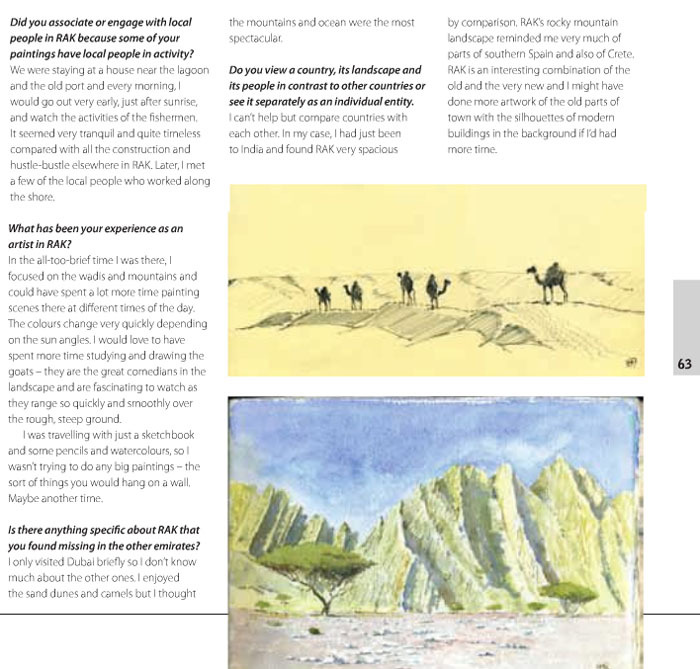 It was a classic bit of new technology: Manju the editor found my website and travel page; I was 'interviewed' with a set of questions by email; I emailed high-res files of the watercolours to his designer; once the magazine was published on paper and on the web, he sent me the url to find the magazine; I made facsimile copies of the magazine's pages to display below.